Nowadays, when the fact that the Portuguese were indeed the first to explore the coast of West Africa has long been unequivocally acknowledged, the testimony of this work is no longer necessary to corroborate this but is now instead invoked to substantiate the hypothesis that the Portuguese had a vague knowledge of Australia during the first half of the sixteenth century. 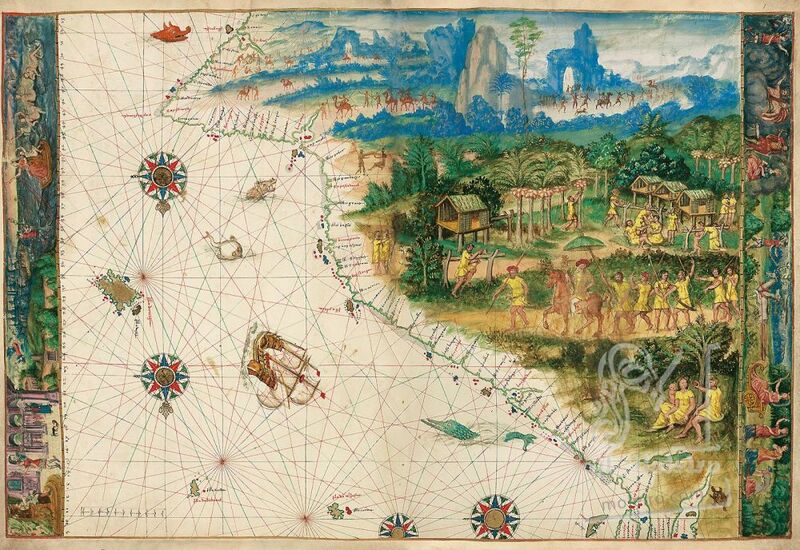 Although neither the Portuguese chronicles, nor archival documentation nor even the Portuguese nautical maps that have survived to modern times contain signs of this knowledge, the fact that the Vallard Atlas appends toponyms that are almost entirely Portuguese to geographical features on coasts that appear to correspond to the Australian continent clearly reveals that these maps were copied from Portuguese prototypes that no longer exist today. This would seem to corroborate the hypothesis that the vast continent that has been drawn, albeit rather inaccurately, in the atlas immediately south of Insulindia, did in fact represent Australia. It is possible that the discovery of Australia was related to the quest for the fabled Pulo Mas (from the Malay Pulau Emas, or “Island of Gold”), which was rumoured to be located somewhere south of Sumatra, whose beaches were reputed to consist of gold dust instead of sand. This Malay legend could have been the result of a vague knowledge of the existence of gold deposits in the Kimberley region in Northwest Australia. Fishermen or merchants from neighbouring islands, such as Flores, who might have ventured there could have found nuggets of gold in the sands of streams in the region; this real fact, magnified by popular imagination, could have subsequently given rise to the myth of Pulo Mas. Perhaps a Portuguese mariner or adventurer inspired by this legend, or someone who had simply been blown off course by the winds, might have sailed south of Timor and stumbled across Australia. Unlike the trade in cloves from the Moluccas and nutmeg from Banda, the trade in sandalwood from Timor was not a royal monopoly and was left to private merchants, who did not leave any archival records for posterity. It is hence not possible to identify when this discovery was made or by whom.